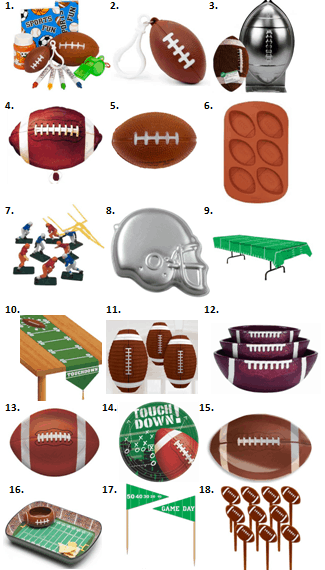 Have any football fans in your house? 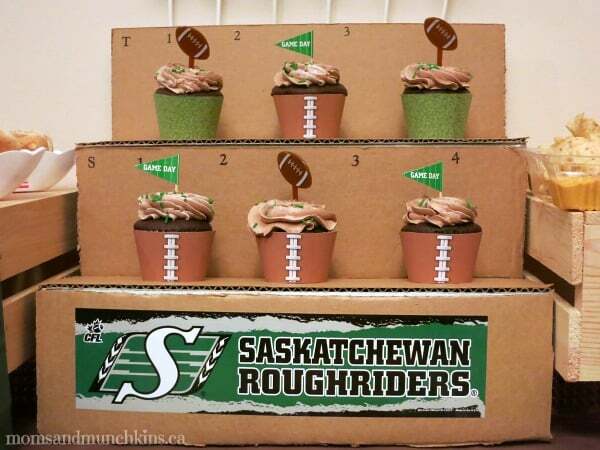 I live in Saskatchewan, Canada and the CFL Grey Cup is in our province this year. It’s going to be quite the party! 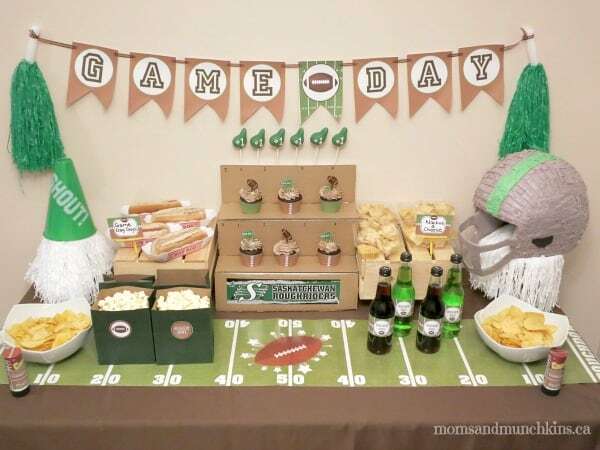 It’s the perfect time to start planning those game day parties! 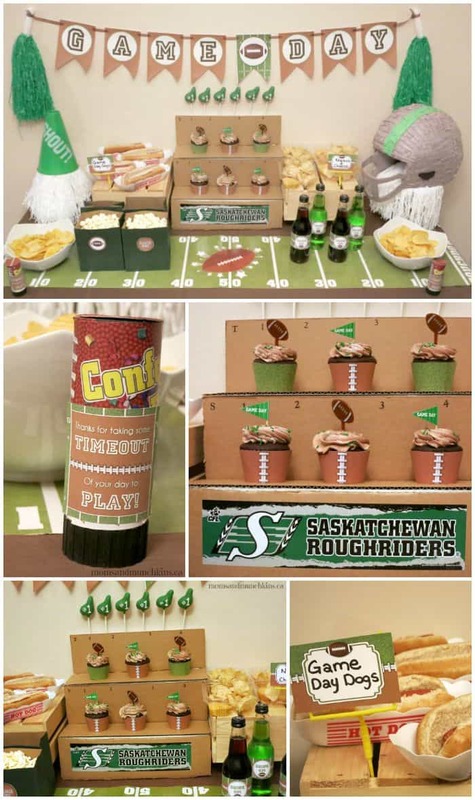 Forever Your Prints put together a creative football party package for us that is general enough to go along with any team. Simply add in a the colors of your favorite team and you’re ready to go! I wanted to do something a little different with the banner so I added a pom pom on either side. I think it turned out cute! You could also take them down later for the kids to use for cheering during the game. I used a plain brown tablecloth topped with a football field print table runner. Want to know where to buy some of these supplies? I’ll share some links at the bottom of this post. Upside down wooden crates were used as platforms to hold the snacks. 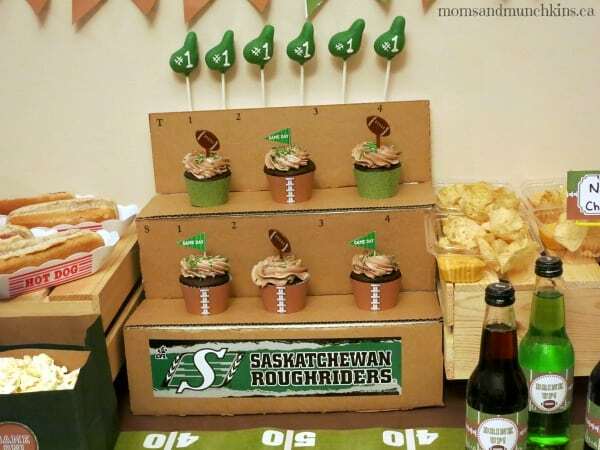 I wanted the main piece on the table to be fan bleachers to hold the cupcakes. We were going to build something out of wood but as I started putting together an example using an old diaper box so my husband could see my vision I thought “Hey! This will work and save us having to saw wood!”. I added on a Roughridgers bumper sticker and some numbers for seating on the bleachers. 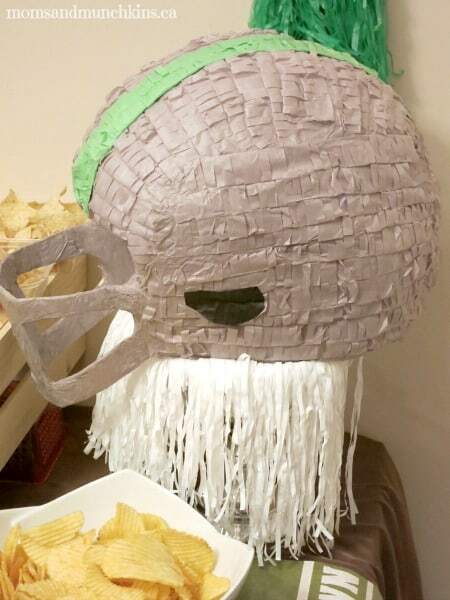 Party decorations don’t have to be fancy to be fun. 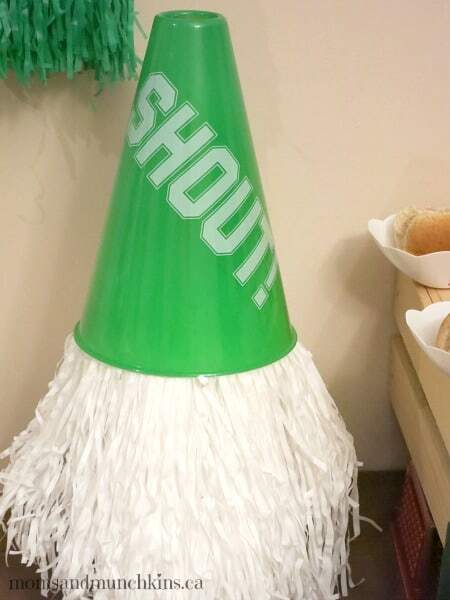 I found a football helmet pinata at Target that I thought would be perfect on the table and paired it up with a “Shout!” cheering cone on the other side of the table. 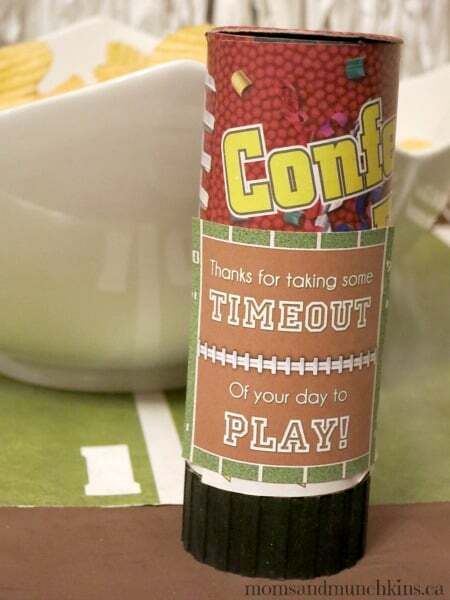 For some messy fun, I added on a few Football Confetti Poppers as favors on the table. If you don’t mind the mess, you pop one confetti canon each time your team scores a touchdown. 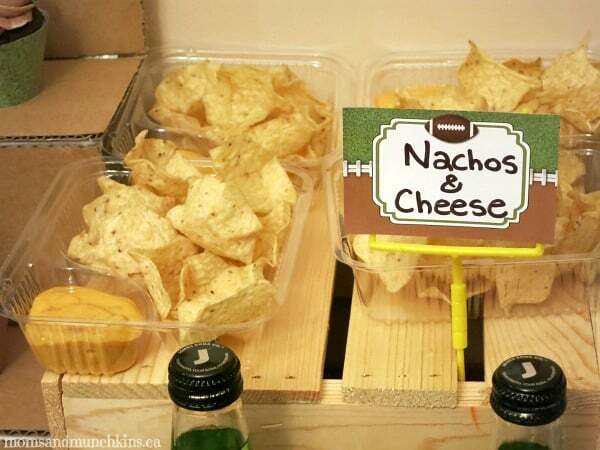 For food, I went with a concession style theme. 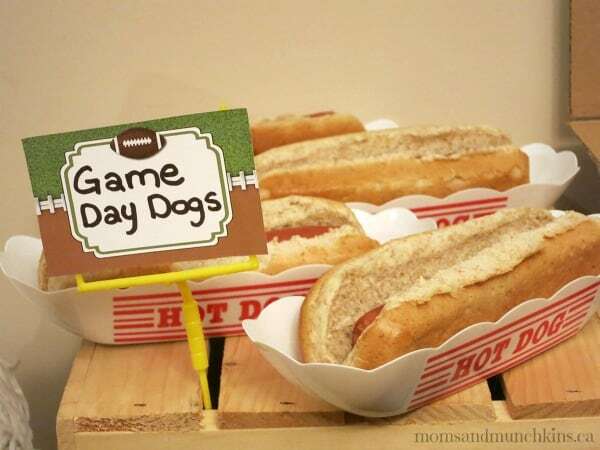 To hold the signs for the food, I used mini goal posts that were part of a cake decorating kit. Hot Dogs were served in little plastic “hot dog” holders from the dollar store. 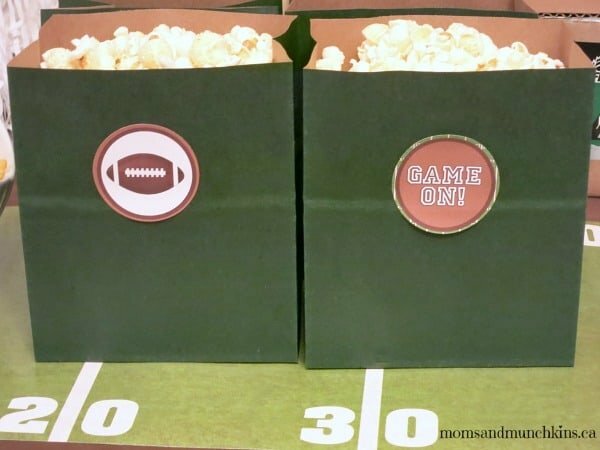 Popcorn was served in small green paper bags and dressed up with printable party circles. Chocolate cupcakes iced with chocolate icing and topped with green sprinkles were decorated with football-themed food picks. 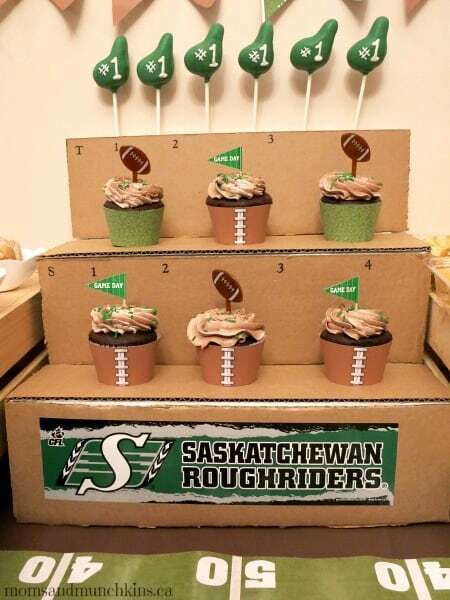 They were wrapped with printable football cupcake wrappers. 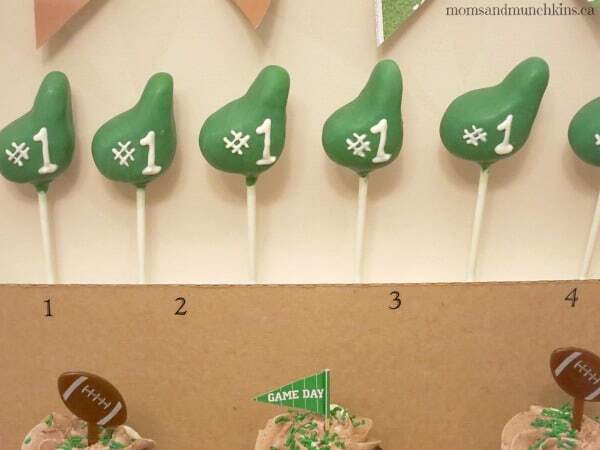 One of my favorite parts of the party are the fan foam finger shaped cake pops by Celebrations Cake Pops. I placed these in styrofoam behind the fan stands. Aren’t they cute?! 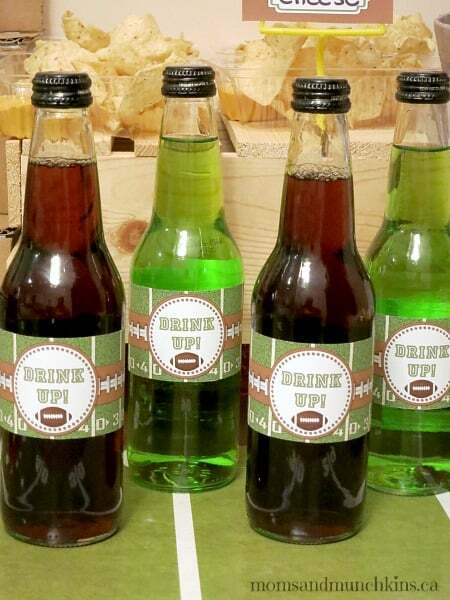 To stick with the brown & green theme, I served root beer and apple pop with printable bottle labels. *Disclosure: I am part of the Amazon and Birthday in a Box affiliate programs. All opinions expressed here are 100% my own. Awesome display! I was happy to help out! This looks so awesome!! I wish my parties came together as nicely as this is! I’m not a football fan, but your post almost converted me! Looks like fun! Thanks for linking this up to After School. Oh, this is perfection. You did an amazing job putting this all together. I especially love the cupcakes. So adorable! Thanks for sharing and for linking up to Thrifty Thursday. Cheryl, I am a huge football fan and I just LOVE your party! Thank you so much for joining us and sharing at Best of the Weekend! Pinning and sharing! Hope you are having a wonderful weekend! I saw your post at the link party and had to respond since we are huge Rider fans. We live in Regina and my husband is actually chairing the Grey Cup committee this year. Wish you could have decorated for the party we just had for the organizing committee. You should post your picture at http://www.101GreyCupFestivalphotos.ca it’s a collage of photos celebrating the Riders. Hi Joann! Thank you for the wonderful feedback & support! I just visited the site to upload a picture – thanks for telling me about it!